Status: Rare casual summer visitor central. Accidental in spring. Documentation: Specimen: HMM 21718, 14 Oct 1918 Kearney Co (Black 1933, 1941; Bray et al 1986). Taxonomy: Two subspecies are generally recognized (Gill and Donsker 2017): ruficollis (including occidentalis) in southern North America, south to northwestern South America and Trinidad, and tricolor in northeast and north-central South America. The Nebraska records are presumed ruficollis (Pyle 2008). Spring: There is one documented report, of an adult at Swanson Reservoir, Hitchcock Co 29 Apr 2001 (Jorgensen 2003). Two additional reports are of one in Sarpy Co 13 May 1991 that may have been the same bird as that seen across the Missouri River in Iowa 4 May 1991 and acceptably documented there (Korpi 1991, Greer 1992) and another reported in Lancaster Co 22 May 1997 without details. Spring records such as these are likely birds moving north to northeast South Dakota, where breeding was first noted in 1986 and has occurred in two other locations since (Tallman et al 2002). Summer: There are four accepted records, including a very late date. Reports in Jul-Aug are presumably post-breeding or post-fledging dispersers from southern North America. 14 Oct 1918 (cited above). In addition, one was collected 10 Aug about 1918 at Inland, Clay Co; the specimen is now lost (Cink 1973; Bray et al 1986). 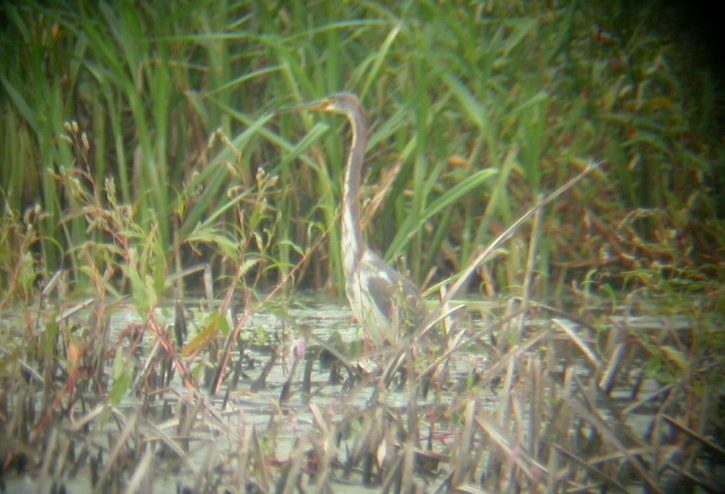 Photograph (top) of a Tricolored Heron in Clay Co 30 Aug 2003 by Joel G. Jorgensen. Black, C.A. 1933. An addition to the Nebraska bird list: The Northern Louisiana Heron. NBR 1: 31. Black, C.A. 1941. The Northern Louisiana Heron in Nebraska: A correction. NBR 9: 16. Brogie, M.A. 2004. 2003 (15th) Report of the NOU Records Committee. NBR 72: 59-65. Cink, C.L. 1973. Louisiana Heron in Clay County. NBR 41: 14-15. Greer, J.G. 1992. Tricolored Heron in Pottawattamie County. Iowa Bird Life 62: 88-89. Pyle, P. 2008. Identification Guide to North American Birds. Part II, Anatidae to Alcidae. Slate Creek Press, Bolinas, California, USA. Silcock, W.R. 2003. Summer Field Report, June-July 2003. NBR 71: 106-127.